In this post, we look at some of the differences between the ballroom and Latin American normal holds, and remind ourselves of a few of the key ingredients for a good frame before we even start moving the picture around the dance floor. We look at various aspects from the fingers, arms, elbows, bodies, stretch, and, if you have any capacity for more, how to increase awareness of some of those areas through practice and exercises. A stylish, smart ballroom hold can be something we take for granted as our pursuit for mastering the latest steps becomes our reason to be. Let’s take a few minutes first just to remind ourselves of some properties of the hold as we prepare to hit the dance floor. 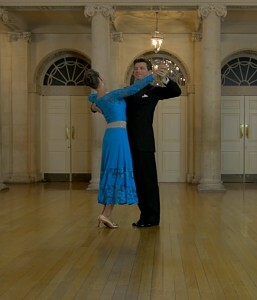 For our ballroom hold, first we ensure our weight is carried forwards, not backwards, as we prepare to take the hold. Followers, have a look at the side view of your wonderful leader and check that the torso is vertical, not sloping backwards in an effort to gain volume and shape. If your leader looks like they’re doing the limbo (sometimes they really are! ), then just reach for their favourite tipple and balance it on top of their head for a while (Try Bill Irvine’s Tea Cup trick https://www.youtube.com/watch?v=EVYDXfSbiN4 ). We stand slightly offset from our centres to allow the right front of our bodies, from our hipline to mid-torso, overlap with each other. We normally teach our beginner dancers to use a greater overlap, then encourage reducing the overlap as their dancing progresses; stand too much to each other’s right side from the outset and you’ll often end up completely side-by-side in the classic ‘hip-toss’ position! Keep the arms held with tone. For both roles, we should feel a strong vertical stretch; something very distinct from a rise! A little exercise used to illustrate this is to find a willing partner to place their hand firmly on your head. Now stand up straight and with your heels on the ground feel that you are pushing up against their hand as they push slightly harder down on your head. Gradually release the hand but maintain that stretched feel; walk around, rise then release your weight, but maintain that vertical stretch as you move. Now ask yourself if you normally dance your ballroom and Latin with a good stretch or not. A few reminders about the arms next, starting with a good stretch across the elbows as we form a frame. Hold the arms with tone, gently sloping from the shoulder line, but without undue physicality. Try and sense this tone stops in the wrist area. For example, the leader’s right wrist makes a vertical connection to the follower and the leader’s right hand will then follow the follower’s back. Take a look at our position here which is not our fully developed hold, but slightly more relaxed. 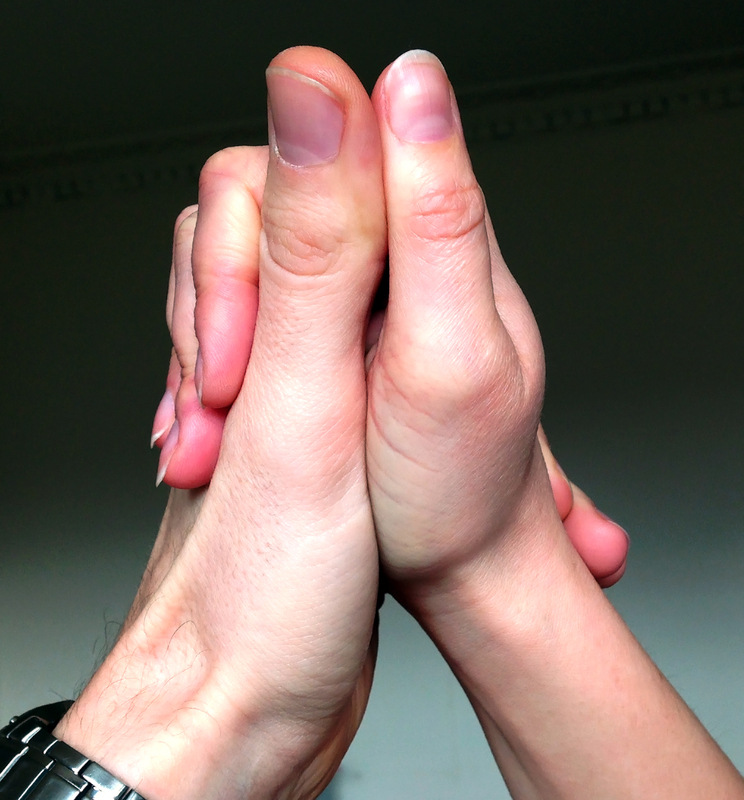 For the joined hand, ensure that the follower’s fingers aren’t squeezed to death by the leader’s left hand but rolled elegantly over the top of the leader’s v-shaped fingers of the left hand. Also check the raised hand is mid-way between leader and follower as it can be frequently seen preferring to edge behind the follower! With the close proximity of each other in ballroom dancing, it is quite often the leader’s right hand which is given the fatal opportunity of guiding the follower into the latest figures gleaned from the re-run of Strictly. As all good leader’s know however, it is the leader’s body that should be doing the work allowing the right hand to have a much less stressful time, gently following the follower’s back. In social dances we quite often see Latin dances approached with a hold too similar to a ballroom hold with the elbows alongside the body. One of the biggest changes we see from ballroom to Latin is the increased distance between leader and follower to allow for freer movement. In order to achieve this, we must release the arms more forward than our ballroom hold. Imagine you hold a small hula-hoop between the two of you and be aware of maintaining your own dance spaces as you dance, only invading the other’s space by way of ‘dance invitation’. Keep this hold relaxed, free, but with tone and be very aware of returning to a good, smart-looking normal Latin hold after changing holds for other choreography. It is good to be very distinct with the different holds and have an awareness of your own dancing space and how that relates to each other for all of the variations you dance. Ensure with the changing holds you have a very free and quick change between the various hand positions and connections. Without moving, try switching your holds and hand positions very freely from one to another, making the transitions clean and precise. Quite often it isn’t the next figure which gives complications, but what happens in between which helps bring clarity. Maintain the vertical stretch we exercised for our ballroom hold too. The development of hold or frame should be seen as an area which develops like any other aspect of dancing. With the tendency to focus on learning the steps and latest choreography trends, some of these common qualities, and others we haven’t had time to mention here, can easily get overlooked. A few minutes spent on them can bring great rewards and we’ll be discussing other ways to bring even more quality into your dancing in a future post. This entry was posted in Ballroom & Latin and tagged Ballroom Hold, Dancing Hold, Frame, Latin Hold, Modern, Partner Hold, Standard, Technical Tips, Technique, The Hold, waltz by vivaladance. Bookmark the permalink.